To cancel ACC with LSF, do any of the the following: • Press the CANCEL button. • Press the MAIN button. - ACC with LSF indicator goes off. 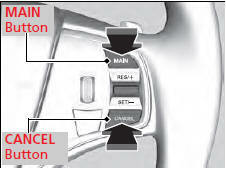 - When the LSF function has stopped the vehicle, you cannot cancel ACC with LSF by depressing the brake pedal. • Your vehicle speed slows to 22 mph (35 km/h) or below when a detected vehicle goes out of the ACC with LSF range. • When the radar sensor in the front grille gets dirty. • The vehicle ahead of you cannot be detected. • An abnormal tire condition is detected, or the tires are skidding. • Driving on a mountainous road, or driving off road for extended periods. • Abrupt steering wheel movement. • When the ABS, VSA® or CMBSTM is activated. • When the VSA® system indicator comes on. • When the vehicle is stopped on a very steep slope. • When you manually apply the parking brake. • When the detected vehicle within the ACC with LSF range is too close to your vehicle. Resuming the prior set speed: After you have canceled ACC with LSF, you can resume the prior set speed while it is still displayed. Press the RES/+/SET/ – switch up when driving at a speed of at least 25 mph (40 km/h) or more. Even if your vehicle speed has gone down to less than 25 mph (40 km/h), you can still resume the prior set speed when ACC with LSF detects a vehicle ahead of you. Wait until the condition that caused ACC with LSF to cancel improves, then press the RES/+/SET/– switch down. • The driver’s seat belt is unfastened when the vehicle is stationary. • The vehicle stops for more than 10 minutes.